A 3CD box set collection chronicling Miles’ musical evolution in the studio from 1966-1968 working with his “second great quintet,” the latest edition in Columbia/Legacy’s acclaimed Miles Davis Bootleg Series provides an unprecedented look into the artist’s creative process, drawing on full session reels including all rehearsals, partial and alternate takes, extensive and fascinating studio conversation and more. Celebrating the 50th anniversary of Miles Smiles, the groundbreaking second studio album from the Miles Davis Quintet–Miles Davis (trumpet), Wayne Shorter (tenor saxophone), Herbie Hancock (piano), Ron Carter (bass) and Tony Williams (drums)–this definitive new collection includes the master takes of performances which would appear on the Miles Smiles (1967), Nefertiti (1968) and Water Babies (recorded 1967, released 1976) albums alongside more than two hours worth of previously unreleased studio recordings from original sessions produced by Teo Macero (with the exception of “Fall,” produced by Howard A. Roberts). “Circle,” “Orbits,” “Dolores” and “Freedom Jazz Dance” were recorded at the historic Columbia 30th Street Studio in New York City on October 24, 1966. “Gingerbread Boy” and “Footprints” were recorded at the same location the following day, October 25, 1966. Full session reels – every second of music and dialogue – that were taped for the Miles Smiles album are included. Prior to this the only material ever released from the classic album were the master takes for the six songs. Never before have the full session reels for an entire Miles Columbia album been released, here providing an in-depth look at the studio process of one of jazz’s greatest bandleaders, and arguably the greatest small jazz group ever. “Masqualero”, heard on the set in a previously unreleased alternate take, was recorded at Columbia 30th Street Studio on May 17, 1967. “Water Babies” and “Nefertiti” were recorded there on June 7, 1967. “Fall” was cut at the Columbia studio on July 19, 1967. Complete session reels for “Water Babies”, “Nefertiti” and “Fall” are included in the box. “Country Son”, heard in a unique previously unreleased rhythm section only rehearsal, was recorded at Columbia Studio B in New York City on May 15, 1968. Miles Davis Quintet: Freedom Jazz Dance: The Bootleg Series, Vol 5 box set was produced for contemporary release by the multi Grammy Award winning team of Steve Berkowitz, Michael Cuscuna and Richard Seidel. The album was mixed from the original 4-track tapes and mastered by Grammy Award winning engineer Mark Wilder, Battery Studios, New York City, July 2016. In addition to more than two hours of previously unreleased studio sessions, the collection includes “Blues in F (My Ding),” a rare and unique home recording featuring Miles, demonstrating on piano a new blues he was working on to Wayne Shorter. Miles Davis Quintet: Freedom Jazz Dance: The Bootleg Series, Vol 5 includes revelatory behind-the-scenes liner notes penned by Grammy Award-winning Ashley Kahn, author of Kind of Blue: The Making of the Miles Davis Masterpiece, as well as new interviews with Quintet members Ron Carter and Wayne Shorter. 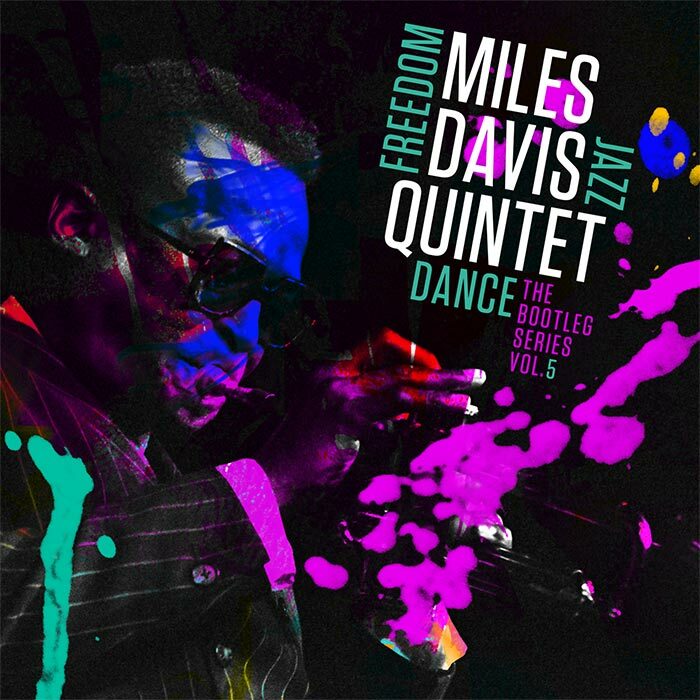 Sourced from original four-track analog session reels and master tapes transferred and mixed in high resolution at 24-bit/192 kHz, Miles Davis Quintet: Freedom Jazz Dance: The Bootleg Series, Vol 5 offers a profound and intimate look at Miles’ creative process in the studio, providing insight into the bold new musical directions Davis and members of his quintet would take as the 1960s drew to a close. Miles Davis Quintet: Freedom Jazz Dance: The Bootleg Series, Vol 5 is the fifth installment in Legacy/Columbia’s ongoing commitment to the musical and cultural impact of Miles Davis, finding new ways of exploring and appreciating the Miles Davis catalog. Live in Europe 1967: The Bootleg Series Vol. 1 (released September 2011) was the most acclaimed historic jazz box set of 2011, receiving a “5-star” review from Down Beat magazine, where it was voted Historical Album of the Year in the Down Beat 2012 Readers and Critics Poll. The album was ranked #1 reissue in the Readers Poll of JazzTimes magazine while the Jazz Journalists Association voted it Best Historical or Boxed Set. The set peaked at #3 on Billboard’s Top Jazz Album Charts. Miles Davis Quintet – Live In Europe 1969: The Bootleg Series Vol. 2 (released January 2013) won the Jazz Journalists Association Historical Record of the Year, voted Historical Album of the Year in the Downbeat Readers and Critics Poll, and #1 reissue in both the Critics and Readers polls of JazzTimes magazine. Like its predecessor, the album also peaked at #3 on Billboard’s Top Jazz Album Charts. MILES AT THE FILLMORE – Miles Davis 1970: The Bootleg Series Vol. 3 (released March 2014) won the Jazz Journalists Association Historical Record of the Year, voted the #1 Historical Album of the Year in the 2014 Downbeat Critics Poll, #3 Historical Album of the Year in the 2014 JazzTimes Critics Poll, and included in Rolling Stone’s Best Reissues of 2014 list with a 4.5/5 STAR rating. The set peaked at #1 on Billboard’s Top Jazz Album Charts. MILES DAVIS AT NEWPORT 1955-1975: The Bootleg Series Vol. 4 (released March 2015) was voted the #1 Historical Reissue in the 2015 JazzTimes Critics Poll and won Historical/Reissue/Vault Release in the 2015 JazzTimes Readers Poll. The set was also named in Downbeat’s “Best Albums of 2015” list, received 4 Stars in the Historical category and in Downbeat’s Critics Poll was the winner in the Historical Album category. The set won the 2016 NAACP Image Award for the Outstanding Jazz Album category. Miles Davis, American musical icon and international cultural archetype, would have turned 90 years old on May 26, 2016. To commemorate Miles 90th, Legacy Recordings (the catalog division of Sony Music Entertainment) and Polygraph.cool (the groundbreaking online publication pioneering the art of interactive graphic forensics) launched the Universe of Miles Davis, an immersive destination website visualizing the astounding ongoing cultural impact and importance of Miles Davis. An innovative 21st century interactive platform, the Universe of Miles Davis is as revolutionary as the artist and genius it celebrates.